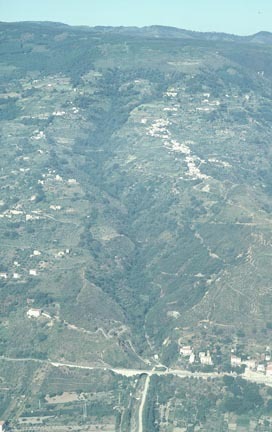 Eastward oblique aerial view of Piano Marino, the high, north-tilted surface of which is cut by the deep dark gorge, Manno Nicolo. The flat with the tower in the right center is an abrasion surface on Miocene and Pliocene sandstone. Manno Nicolo, which cuts deeply into sandstone, empties into Catacastro fiumara at the north end of Amantea. Map Sheet 1 (small | large). 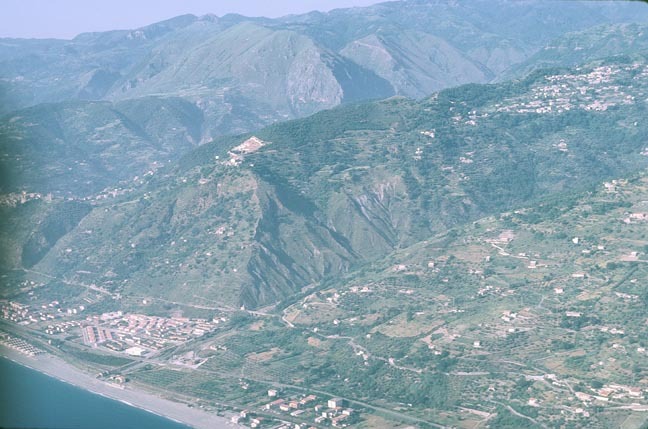 Northeastward oblique aerial view of Aquacella (foreground), Comolo Inferiore, Belmonte Calabro, with Monte Cucuzzo on the skyline. Bedrock between the sea and Belmonte Calabro is Miocene and Pliocene sandstone. Several levels of wave-cut terraces, each veneered with Quaternary gravel and sand, may be discerned in this view. Map Sheet 1 (small | large). 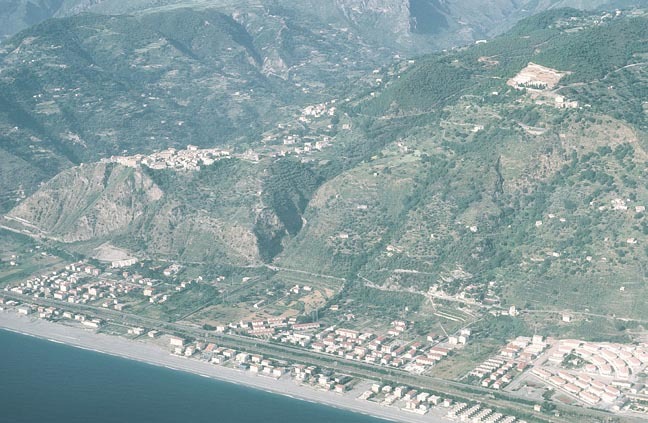 Oblique aerial view northeastward of mountain front between T. Santa Barbara and T. San Martino with coastal plain and two wave-cut terraces. The higher terrace is cut on phyllite of the Bagni Formation, as is the lower one in the lower right corner of the image. A major strand of the coastal fault zone is at the break in slope between the coast plain and the cliffs. Map Sheet 2 (small | large). 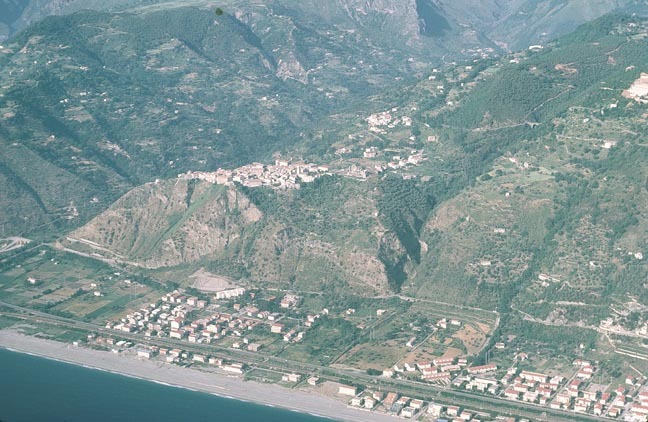 Oblique aerial view east of Santa Barbara village between T. Santa Barbara to the south and T. Santa Croce on the north. The cliff front is underlain by fault-bound slices of Bagni Formation phyllite. Map Sheet 2 (small | large). Aerial view east up T. Santa Croce with Santa Barbara village on the south ridge. 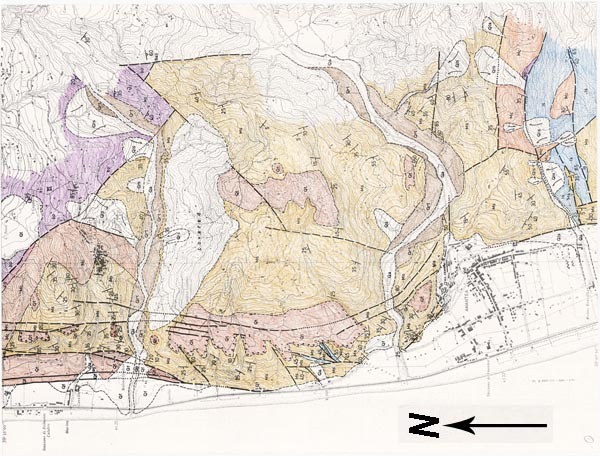 The inhabited area east of the main road is underlain by Frido Formation slate and quartzite.Map Sheet 2 (small | large). 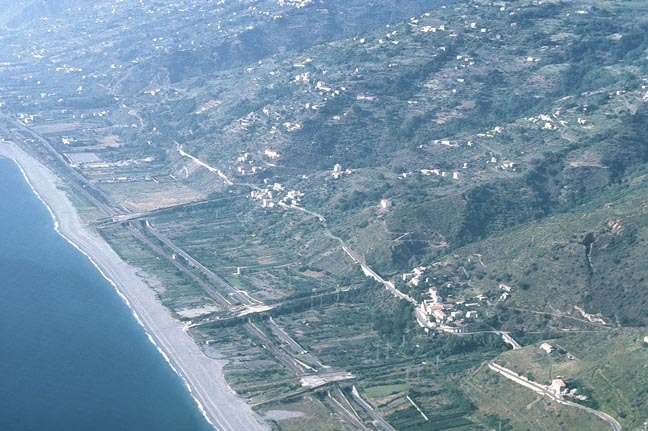 Oblique aerial view northeastward of the area between T. S. Barbara and Longobardi (upper left corner). From bottom right to top left, T. Santa Barbara, T. Santa Croce, T. Agosto, and T. Cordari. 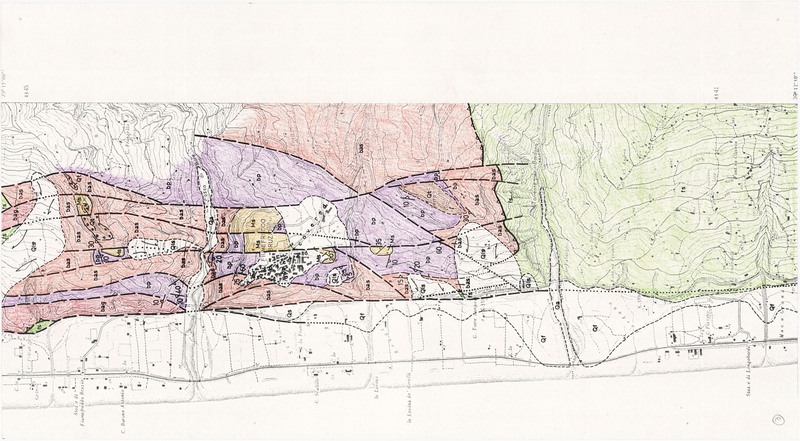 The larger cluster of buildings in the lower right corner is Campo Mare, which lies upon marine terrace gravels and sand that overlie Bagni Formation phyllite. Tarifi is almost in the center of the image. 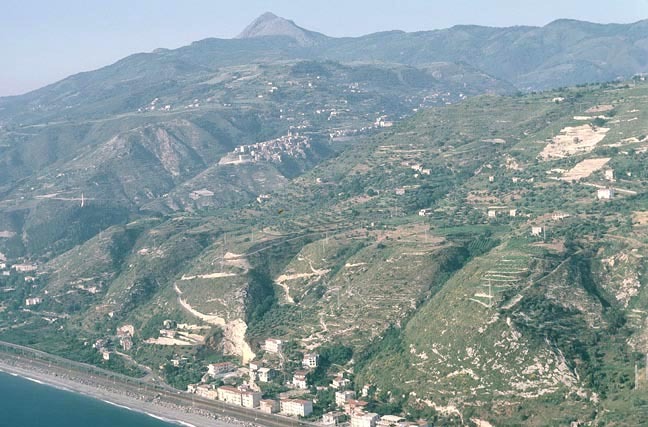 A fault or fault-line scarp is at the break in slope between the coastal piedmont and the steep slopes. 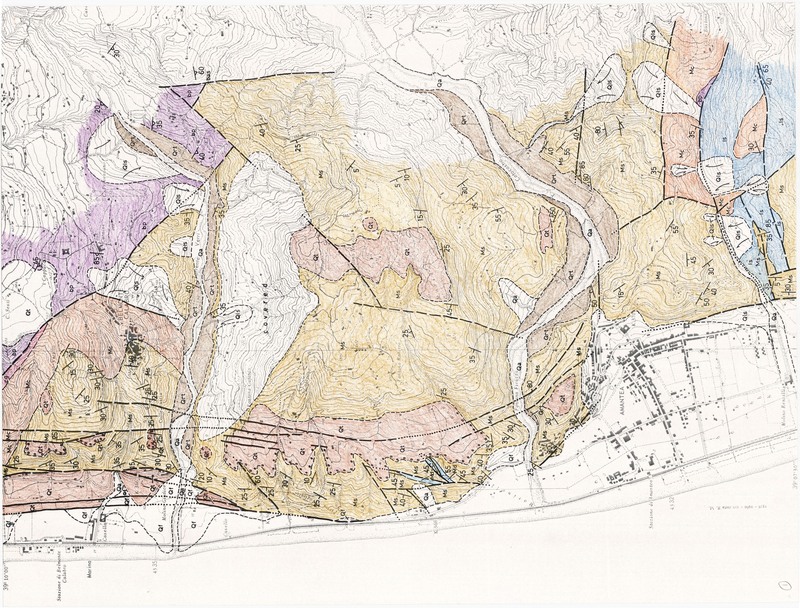 Note how walled channels carry the streams out of each of the canyons across the highway and railroad. Map Sheet 2 (small | large). Aerial view NE toward S. Serra across T. Bardano. 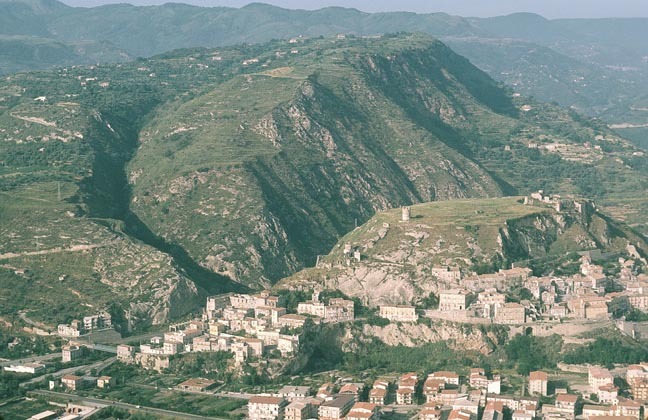 The Longobardi area, underlain by slide-prone Frido Formation slate and quartzite, comprises the gentle slope south of T. Bardano in the lower right part of the image, whereas the ridge north of T. Bardano is underlain by Frido Formation that is capped by an overthurst slab of Bagni Formation augen schist. The Diriotti slide is at the west end of the ridge above Torremezzo. A major strand of the coastal fault zone is at the break in slope between the coast plain and the cliffs. Map Sheet 3 (small | large). Oblique aerial view eastward of T. Bardano. 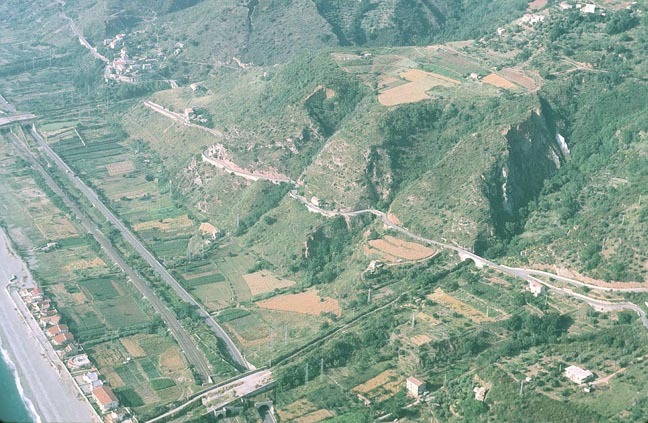 This big canyon separates the gentle slopes of the Longobardi area (right), underlain by Frido Formation slate and quartzite, from Bagni Formation augen schist and phyllite (left). The built up area in the lower left corner is Torremezo. Map Sheet 3 (small | large). 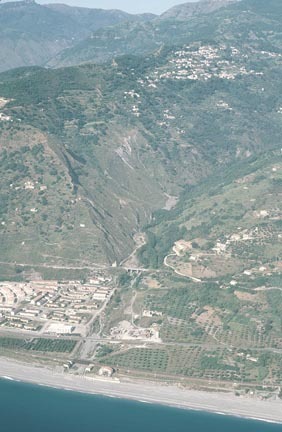 Oblique aerial view NE of mountain front below Fiumefreddo. Fosso di Mare is the big canyon behind Fiumefreddo. Torremezzo below the Diriotti landslide is in the lower right corner of the image. A major strand of the coastal fault zone is at the break in slope between the coast plain and the cliffs. Map Sheet 3 (small | large). 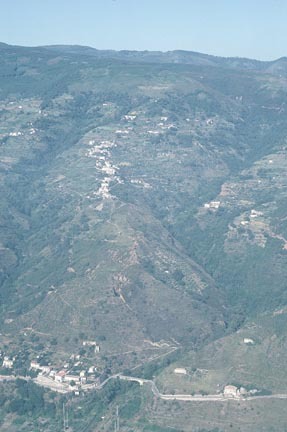 Aerial view ENE of mountain front below Fiumefreddo village. The big canyon north of Fiumefreddo is Fosso di Mare; the deep dark one to the south is Vallone dell Oscuro. Part of Torremezzo is in the lower right corner. A major strand of the coastal fault zone is at the break in slope between the coast plain and the cliffs. Strands of the fault are in the face of the steep cliff below Fiumefreddo. Map Sheet 3 (small | large).